Tax payer bailed-out and 82% owned RBS remains one of Britains largest weapons of mass financial destruction that along with its subsidiaries such as Nat West literally crashed Christmas for millions of its customers as debit cards were declined and ATM's went offline on cyber monday freezing customers out of their accounts on the busiest shopping day of the year that continues today. As the above illustrates this is not the first time that RBS has effectively ceased to operate as bank by locking customers out of funds deposited with the banks, as such RBS 'bank holiday's have taken place at least half a dozen times during the past two years and for some customers has become a near monthly occurrence. The latest RBS banking catastrophe follows hard on the heels of mainstream media reports that have actually been bubbling in the Blogosphere for more than 4 years that RBS and other banks allegedly deliberately bankrupted many companies by putting them into default on loans so as to effectively steal their assets such as properties for a pittance at auction fire sales. Despite all of this and more such as PPI and LIBOR, RBS will soon still be paying out healthy Christmas bonuses totaling more than £500m to its senior staff despite reporting a LOSS of £5.2 billion, and I am sure RBS senior staff will take the current systems crash as another opportunity to reward themselves more bonuses for bringing day to day banking systems back online just as I wrote a month ago that the RBS plan for an internal bad bank was so as to engineer artificial profits on the basis of which huge bonuses would be paid out. Again RBS's senior staff should have spent the past 5 years of artificial QE money printing profits writing down the bad assets but instead been paying themselves billions in bonuses! I fear that the internal RBS bad bank will further the fraud on tax payers as assets transferred to the bad bank could be heavily marked down in value which could then be sold at a profit and thus result in further massive bonuses for RBS staff, whilst obviously a heavy loss has been sustained on the GOOD bank! Which means that the Bad bank could out perform the Good bank, in terms of profits! Yes, given RBS and the big banks track record this is likely how the next fraud on tax payers will play out during 2014. The bottom line is that the tax payers through direct bailouts and the money printing inflation stealth tax consequences continue to pump artificial profits into banks such as RBS. However with the formation of an internal bad bank (some 5years late!) as the bad assets evaporate (get sold off) then the Bank of England will likely reduce its funding of bank profits and thus RBS's revenues will shrink, which means that RBS will also continue to shrink in size long after it has been privatised, so it does not look like a good long-term investment proposition. There is another equally plausible reason for the mess at RBS and that is one of under invested systems asked to perform duties they were never designed to do such as internet / smart app banking that opens the bank up to cyber criminals to hack there way into tens of thousands of accounts, the only response to which would be for RBS to pull the plug on the whole system before thousands of accounts were drained of funds. However, for obvious reasons such as tens of thousands of customers would lose confidence in RBS being a safe place to deposit funds, RBS WILL go out of its way NOT to admit to such large scale cyber crime and instead go for the marginally better public relations option of being incompetent. There are a few reports in the mainstream broadcast news that suggests that this may be the case because some customers having gained access to their accounts are reporting that credit balances have vanished into thin air. Meanwhile the mainstream media is reporting that UK savers have withdrawn a record £23 billion from savings accounts over the past year that the media largely attribute to an improving economy that is encouraging spending. 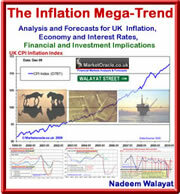 However, the truth is far removed from that which the media assumes are the reasons as the answer lies in the exponential inflation mega-trend which is the primary consequence of money printing debt monetization programmes that the government is engaged in, in an attempt to buy votes through high deficit spending, an inflation trend that asset prices are leveraged to and oscillate around which currently has UK inflation compounding at the rate of 2.2% per year which resolves in the following exponential trend. The above graph shows that over 5 years your (to May 2012) money on the official CPI measure has been eroded by Inflation to the tune of 17.2%!, This IS the reason why your real experience of day to day living expenses does not match government / BBC propaganda. However it is even worse because as I keep mentioning the rate of Inflation is EXPONENTIAL. What this means is that if you stuffed money under your mattress 20 years ago, today it would have been inflated away by 52.5% CPI and on the more recognised measure RPI of 74%, to be worth approaching half its original value. As I pointed out near 4 years ago in the Inflation Mega-trend ebook (FREE DOWNLOAD), Governments only have one answer which is to PRINT MONEY! No matter what names it goes by, be it called QE, or government bonds, it is all money printing that results in Inflation. Again, the consequences of the exponential inflation mega-trend stealth theft of savers wealth is worsened by the 20%-40% additional theft by means of double taxation on savings interest i.e. Inflation steals the value of your savings by currently about 3% then the government taxes you by 20% to 40% on the sub inflation interest rate that you will be in receipt of which means that savers are guaranteed to lose near 2% of the value of savings per year which the following graph illustrates that over the past 5 years for the top 20% interest paying of instant access accounts, on the CPI + tax measure over 8% has been stolen and on the real Inflation measure over 16% has been stolen. To protect oneself from the global inflation war against savings, savers need to increase risk i.e. if you invest in the stock market then you need to appreciate the fact that it will be far higher risk then leaving it in the bank even if you WILL lose at approx 2% per annum even in the best instant access savings account. However, those that have been reading my articles for some time will already have had over a years head start in the unfolding UK housing bull market that I forecast to be soon trundling along at an inflation rate of more than 10% per annum, a bull trend that I expect to be sustained for the WHOLE of the remainder of this decade! UK house prices as measured by the Halifax (NSA - October ) are now rising at an annualised rate of 8% per annum as opposed to falling at a rate of over 2% per annum when I flagged an imminent UK housing multi-year bull market over a year ago. The UK housing bull market continues to gather steam as it represents one of the primary reasons why savers are ditching deposit accounts for exposure to the unfolding housing bull market that offers one of the few low risk avenues to protect wealth from the inflation stealth theft of wealth as asset prices such as house prices are leveraged to the inflation mega-trend because unlike all forms of money i.e. cash, credit and debt they cannot be printed.